For most retirees, savings and income from assets lasts for less than 10 years after retirement, reducing most to living off the New Zealand Superannuation pension alone. With the average person expecting to be retired for 20+ years, New Zealand retirees expect to live the last 10 or more years of their lives on the government pension only, according to new research for the Financial Services Council (FSC). FSC CEO Richard Klipin says there is a need for greater education and advice prior to retirement. The research, conducted by Horizon Research, delves into the attitudes and expectations of older New Zealanders against the backdrop of what wealth those aged 65+ have accumulated, and how they are spending it. The research estimates for the first time the total wealth New Zealanders expect to take into retirement, and whether retirees are under or over in regards to how financially well off they will be after they stop paid work. “Those over 65 and retired think they need $655 per week to live comfortably. Our research shows that, in reality they have, on average, $437 per week, which is a gap of $218. "This is a considerable gap which is even bigger for those who don’t own their own home,” Mr Klipin said. The concentration of wealth in a few asset classes, particularly property, indicates New Zealanders could benefit from greater knowledge of potential investment types. The research shows that over half (54%) of homeowners aged 65+ are planning to sell their home to help fund their retirement. As home ownership rates drop amongst today’s young New Zealanders, this indicates a need to better educate the New Zealand population on how to grow and protect savings and assets. ‘There remains a significant opportunity to better serve New Zealanders with initiatives to help them grow and spend their personal retirement wealth – both in terms of new products and new ways of delivering advice’, Mr Klipin said. 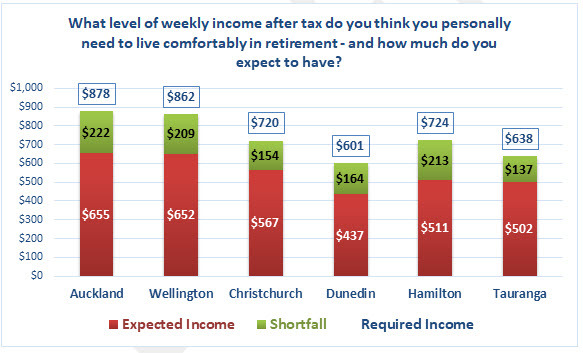 The $218 average after tax weekly gap between what the retired need to live comfortably and what they actually have, sends a message to those still working to make the most of opportunities to grow their wealth and increase their sources of income. New Zealanders aged over 65 are taking more than $632 billion in property wealth into retirement but that wealth is overwhelmingly concentrated in the family home. Grant McInman, Manager, Horizon Research, e-mail gmcinman@horizonresearch.co.nz, telephone +64 21 076 2040.